There are several different methods for creating aluminum pipes. 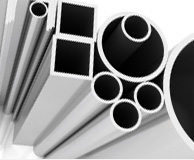 All pipes are created using the aluminum extrusion process which utilizes what is called a solid aluminum blank or slug. A set of tools in a die is used to form the pipe by removing material from the center of the blank, leaving a uniform, straight, hollow aluminum tubing shape. This is the most basic method for manufacturing aluminum pipes. However, further processing can be done to better control the dimensional attributes and improve the strength of the pipe. The drawing process takes the extruded pipe and pulls it through a tool which reduces the diameter of the pipe. Aluminum pipe drawing improves strength, provides a better surface finish, and allows for better dimensional control. When these extra features are not need, however, normal extruded aluminum works just as well as drawn aluminum. Due to the many inherent qualities of aluminum, aluminum pipes are utilized in all kinds of applications. It can be used in some of the harshest environments due to its exceptional corrosion resistance, and its low density allows it to be used in weight sensitive applications. Additionally, aluminum has excellent thermal conductivity making it useful for heat transfer applications. Aluminum pipes have been used in the automotive and heating industry, finding use in radiators and other heating equipment. The agriculture industry also makes extensive use of aluminum pipes in irrigation systems. Aluminum pipes provide the necessary durability and rigidity needed to withstand environmental hazards and heavy machinery. Aluminum is also commonly used to make pipe-fittings like couplings, elbows, and tees. The versatility and reliability of aluminum pipes make them ideal for practically any commercial or industrial application. Aluminum Pipes Aluminum pipes are lightweight, resistant to corrosion, and able to withstand very cold temperatures. Aluminum and its many alloys are some of the most commonly used materials in both industrial and commercial products, and pipes are no exception. More than a half billion aluminum pipes are produced every year just in the United States. These pipes are commonly used as irrigation pipes, heating pipes, and industrial pipe fittings.